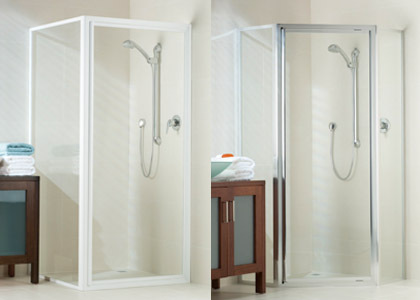 Ideal for busy family households, the Phoenix is a premium quality fully framed shower screen. Strong & robust yet stylish no matter what type of treatment gets thrown at it, the Phoenix will be a welcome fit to your bathroom, whatever the configuration. Shower doors for this screen are custom made to order to suit your layout and measurements. Full length handle. The unique Phoenix full-length moulding is integrated into the door design, creating a strong, yet stylish and minimalist handle. Optional plastic handle. An optional plastic handle is available to provide a larger grip area. Door sill. The door gutter allows excess water to run back into the shower area when the door is open. Proven design. The Phoenix fully-framed shower screens perform in any bathroom. The robust construction provides years of trouble-free service. Range of available colours. Choose a colour to suit your design- black, bright gold, bright silver, pearl white, white birch, barley and matt neutral are available.